On Sale Now! 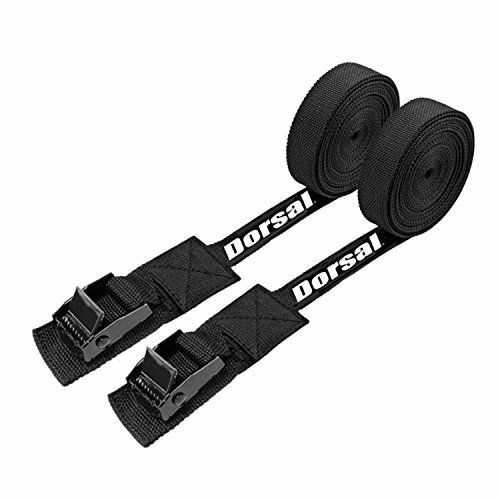 Save 6% on the Dorsal Surfboard Kayak SUP Surf Rack Tie Down Straps 15 FT (2) by Dorsal at Our DXC. MPN: DORSAL-TIE-DOWN-15FT. Hurry! Limited time offer. Offer valid only while supplies last. Surfboard Rack Tie Down Straps - Black The DORSAL tie down straps features a anodized 1'' cam buckle and buckle pads to protect your board. The DORSAL tie down straps features a anodized 1" cam buckle and buckle pads to protect your board. The pair comes in a 15ft length and comes with in set of two straps. Designed by DORSAL in the USA. Surfboard Rack Tie Down Straps - Black The DORSAL tie down straps features a anodized 1" cam buckle and buckle pads to protect your board. The pair comes in a 15ft length and comes with in set of two straps. 600 lb. break strength Designed by DORSAL in the USA.